On the morning of March 6, just as the counting for the 10th state assembly elections began in Manipur, Gaikhangam, the president of the Manipur Pradesh Congress Committee, said on AIR Imphal that he was expecting an unprecedented victory for his party. Even he would not have presumed what the final picture would turn out to be in the evening — the Congress winning a clear two-thirds majority, with 42 seats. Before 2012, no party has won a majority in any of the previous nine state elections. In an assembly of 60 seats, the most a party achieved was the mid-mark of 30 — a feat which the Congress achieved on two occasions. This success becomes all the more significant in view of the “ban” on the Congress — no one should contest in the party ticket or join its rallies or campaigns — announced by the Coordinating Committee (CoreCom) formed by six insurgent groups: the Kangleipak Communist Party, the Kanglei Yawol Kanna Lup, the People’s Revolutionary Party of Kangleipak (PREPAK), the PREPAK (Pro), the United National Liberation Front and the United People’s Party of Kangleipak. The ban proved thoroughly ineffective in stemming the surge in favour of the Congress. This evokes a parallel from 2007 when the Congress had successfully withstood another major challenge — from the Manipur People’s Party, which seemed to embody a resurgent spirit of regionalism. Many factors have contributed to the sweep. The Congress is the only party with a statewide base, enjoying support in both the hills and the plains. It has been the only party that could file nominations in most, if not all, of the 60 seats in all the assembly elections held so far. Besides the particular political tendency displayed by the people of the state to vote for the party that is in power at the Centre, Manipuris went with the Congress because of its promise of stability. Since 2002, the Congress has led two coalition ministries, each lasting a full term, contributing to the overwhelming perception that only it could provide a stable government. This time, the Congress showed its winnability in the hills, from getting just five seats in 2007 it has won 14 of 20 seats — of these five are Naga-dominated constituencies, eight are Kuki-Chin-Mizo-dominated and one from the only three constituencies that saw a close fight between the Nagas and the Kuki-Chin-Mizo groups. In the four valley districts, with 40 constituencies, the Congress won 28. There was a complete capitulation of opposition parties — even the former opposition leader, NCP’s Radhabinod Koijam, has lost. 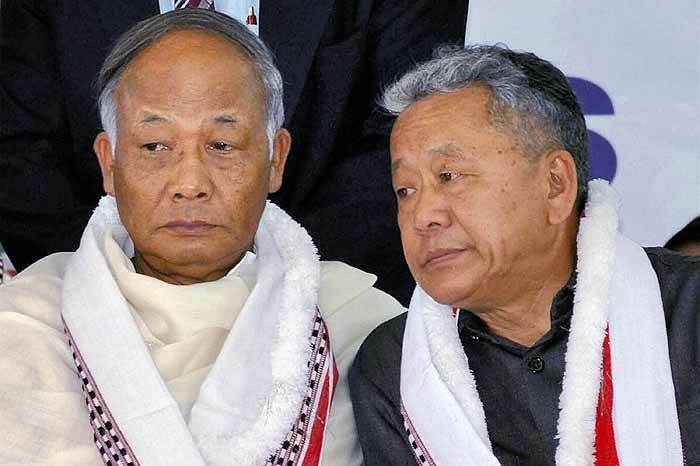 The opposition in Manipur has always been a heterogeneous group lacking unity and unable to provide any policy alternative to the ruling party. This was all the more pronounced this time. Of all the opposition parties in the previous assembly, only the NCP has managed to win one seat this time. For the first time, the Manipur People’s Party has failed to win a seat in the assembly. However, the Manipur State Congress Party (MSCP), which was completely routed in 2007, has made a triumphant return, winning five seats. The Trinamool Congress too made a grand entry into the state assembly, winning seven. The elections also saw three women getting elected. The success of the Congress is also a vote for the protection of the territorial integrity of the state. The party has always been vocal about its commitment to it. Meanwhile, the Naga People’s Front (NPF) won only four seats, speaking volumes about the people’s response to its demand for merging the Naga-inhabited areas of the state into Nagaland or a Greater Nagaland; or for making the Naga-inhabited areas a separate political unit. The NPF lost in eight of the 12 seats it contested, even though 11 of them are Naga-dominated constituencies, The four hill districts are considered to be land of the Nagas, but the NPF won only one each in Ukhrul and Chandel districts, and another two in Senapati. The NPF drew a blank in Tamenglong district, which is predominantly inhabited by Zeliangrong Nagas, bringing to the fore the differences among the Nagas, especially between the Zeliangrong Nagas and other Naga tribes.